Facing Time — a literal reference to the passage of time — shows a clock from an 1897 bank building. Though it seems almost anachronistic today, this lighted, analog clock, with its Arts and Crafts period face, may once have been a celebration of industrial achievement, electricity and the light bulb. It is painted along with hints of the bricks and columns of a stately building from the past. 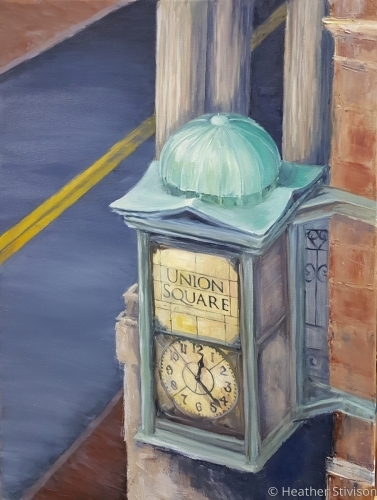 A completely empty, strange, and slightly off-kilter road is angled behind the clock to emphasize the difference between a cold, impersonal present, and the humanity, evident through the work of artisans in the city’s past. This painting was part of the August 2017, True Grit Gallery exhibition, "Post Industrial Impressions." 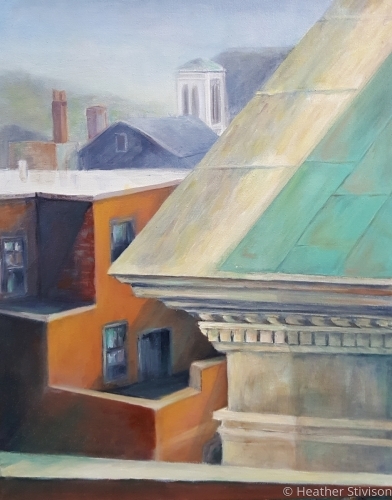 Rooftops of Time is a surreal conglomeration of the various rooftops one sees in the skyline of New Bedford. From the 1897 bank in Facing Time, to a brick apartment building, to industrial smoke stacks in the distance, the view shows the timestamps of the city’s storied history. A mixed media work based on the history of New Bedford, Massachusetts. The central image is an old, green, copper air-vent mounted on a rooftop. As I watched it turn and blow in the wind outside my studio window, it almost seemed alive. I was struck by the idea that it has been tossed by the winds of history for more than a century, and wondered what history might have “seen” blowing through the winds of time. 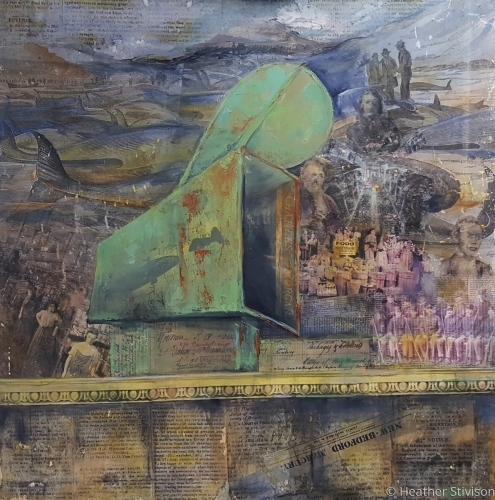 The mixed media piece includes collages and painted references to the changing history of the city. The textile workers feature prominently, shown in their factory to the left of the air vent — while to the right of the air vent there is a 1928 image of a food drive to support and sustain the striking textile workers. The painting was part of the August 2017, True Grit Gallery exhibition, "Post Industrial Impressions."